On this site you can find all our product categories for your BMW R1200RT ✅. The RT stands for travel tourer and identifies a Tourer in a class of it's own, great in comfort and space. With this bike you can not only drive Alpine tours, you can also do long journeys around the globe. This BMW tourer offers with it's 110 HP flat engine enough torque to speed also in highers gears, but not to miss out the cruiser-effect. 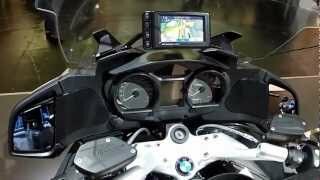 As highlight the BMW R 1200 RT also has integral ABS, which makes save slowing down and possible. As a highlight you find e.g. our GPS mountings suitable for Navigation Systems like TomTom and Garmin. Other highlights are our Tank bags, Insidebags, Intercom System as well as our V-Stream Windscreen which is not only taking off the wind pressure of your helmet, but also makes sure a safe and relaxed driving. Not to forget our garage trolleys, batteries, engine oil or break pads. We have exhaust systems in Slip-on version by Remus and Laser and Öhlins suspenisons to guarantee a maximum of comfort.